Home News How Luxurious Pope Francis’ US Tour is! How Luxurious Pope Francis’ US Tour is! Today is the second day of Pope Francis’ U.S. tour. President Barack Obama welcomed him to the White House around 9 o’clock this morning. Then, the Pope led a prayer ceremony at St. Matthew’s Cathedral at 11 AM and held a canonization mass at the Basilica of the National Shrine at 4:15 PM. You may roll your eyeballs over how luxurious Pope Francis’ travel in the USA is. You may be feeling itchy to know how he will travel and where he will stay during his three-city itinerary. What we are going to share about the Pope’s travel and accommodation will send a shock of surprise down your spine. Pope Francis hit the streets of Washington DC in Popemobile on his second day of the U.S. itinerary. 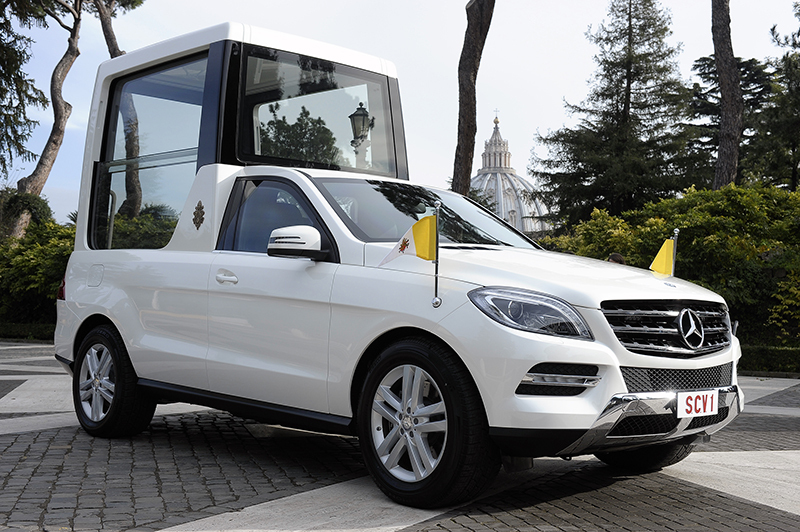 Unlike luxury vehicles, Popemobile is a kind of clown car with a bulletproof glass box on four wheels. Previous popes like Pope Benedict and Pope John Paul used to ride ultra-luxury vehicles by Range Rover and Mercedes-Benz during their foreign tours. But Pope Francis was seen blessing the masses, from the glass box of a Jeep Wrangler, on the streets of America’s capital city today. Reportedly, he will be riding the same vehicle in New York and Philadelphia as well. The way Pope Francis travels in Europe is no way similar to how he will be flying in the USA. He flies on a chartered Alitalia Jet in and around Europe. The US President’s Air Force One is a far talk. Pope Francis will be taking flights on American Airlines from Washington DC to New York to Philadelphia, instead of his chartered jet, which doesn’t come cheap on foreign routes. Usually the press corporation contributes to the cost of his flights in order to get access to him during his tours. Pope Francis keeps a low profile during his foreign tours. Surprisingly, he neither books hotels online nor checks into any hotel when he travels. The Catholic Church is one of the biggest real estate owners in the world. It owns properties across the globe. Evidently, the Catholic Church itself has made arrangements for his accommodation in Washington DC, New York and Philadelphia. The Pope will take rest at the Apostolic Nunciature of the Holy See during his stay in Washington DC. He will retire to bed at Apostolic Nuncio to the United Nations when in New York. It is the Vatican City’s embassy to the UN. Philadelphia will accommodate him at Archbishop Charles Chaput’s residence at St. Charles Borromeo Seminary. All of the places where Pope Francis will accommodate himself during his three-city itinerary in the U.S. do not match even a fourth star hotel. It’s too simple and modest to believe!